The balanced design of the QuickCam Pro 9000 features a powerful microphone on the opposite end of the camera. Your voice will sound clear and bright during video conferencing due to the RightSound technology that reduces background noise. The entire unit also easily mounts to any monitor, including LCD and CRT. Finally, getting started is as simple as connecting the camera to your computer. The QuickCam Pro 9000 sets up quickly on Windows Vista, XP and Linux. Just plug and play. The included software also gives you greater functionality with audio-video mute and RightLight 2 technology. Nothing inspires more trust and good will than seeing someone’s face while talking to them. Share yours with the world and bring home the QuickCam Pro 9000 today! 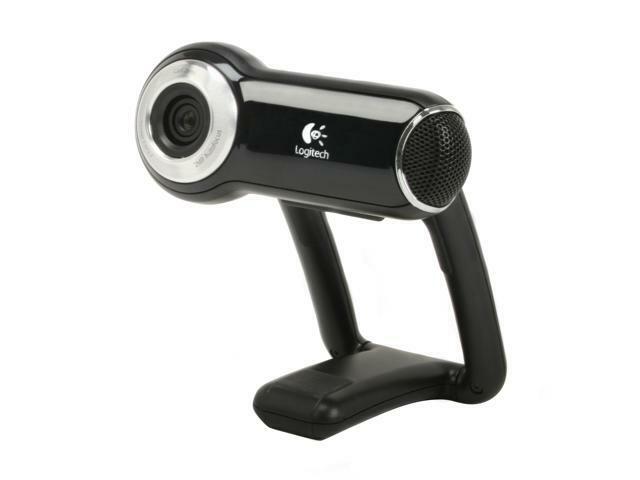 High-Quality Video Capture Combining premium autofocus technology with Carl Zeiss optics, the Logitech QuickCam Pro 9000 produces exceptionally sharp and clear videos at resolutions up to 960 x 720 pixels. Built-in Microphone With the built-in microphone and RightSound Technology, video chat with your friends or leave voice messages to your co-workers quickly and easily. Universal Monitor Clip The Logitech QuickCam Pro 9000 features a universal monitor clip that mounts easily on any type of display or notebook computer. Pros: Sharp responsive picture and good audio quality. Other Thoughts: Bought in March 2010 for $96 on newegg, still works flawlessly. Pros: Good optics, good microphone, no problems. Cons: The mounting system could be more secure. Other Thoughts: I have used this for Skype, Google talk, Mumble, Ventrillo and in-game VOIP systems. High quality audio and video make me happy. Pros: Great Camera for a great price...Never had issues with it and the quality I hear is great on the other side using skype or Oovoo. Pros: Good build quality. Decent video for 6 years ago. Pros: Had this webcam four years. Easy to operate, plugs into any USB port. It produces a great image as tested video chatting between my pc and laptop. Cons: $80, and I dont use it very often. I probably could have gotten by with a cheaper webcam for my needs. Comments: There's little reason to get this webcam anymore since newer versions have come out. Some of which employ H264 compression in hardware (sounds awesome).